A revolutionary optimist and expert procrastinator, Minka Stoyanova subscribes to Wheaton’s Law, believes that brie and red wine will solve most of life’s problems and likes to pretend she is working towards a PhD at City University of Hong Kong’s School of Creative Media. 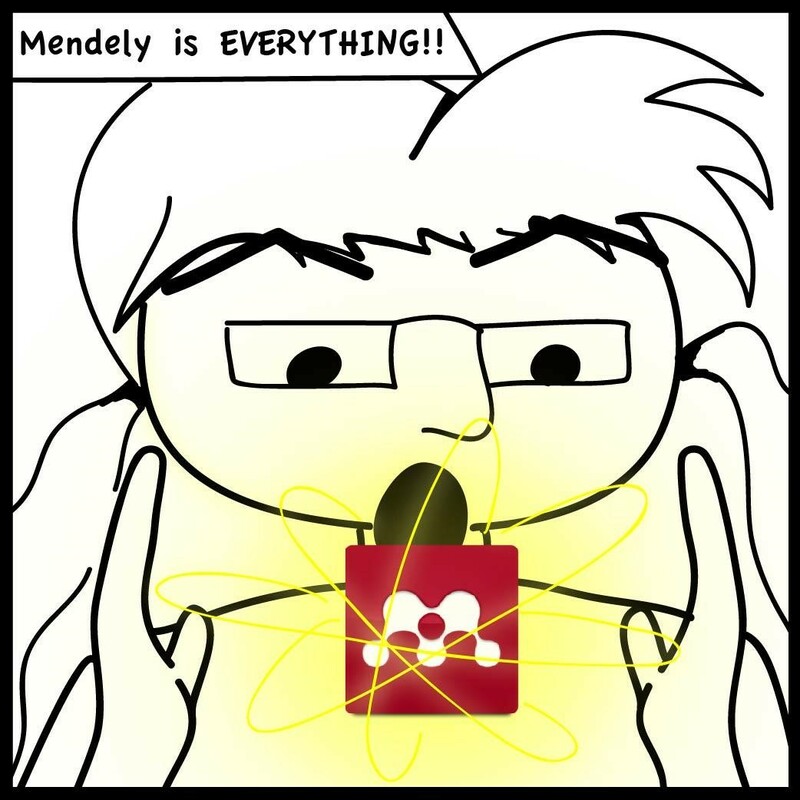 WHAT’S WRONG WITH MENDELEY — and how to get around it. Mendeley is by far the best research management tool I have found to date, however there are some aspects of its complete research suite that some users might find challenging. Everything I have mentioned works best for pdfs and can have limited or no functionality for other file types. This means that users might have to convert documents, particularly e-reader formats to pdf in order to reap the full benefits of Mendeley (I find Adobe Acrobat and Calibre to be powerful conversion tools). Additionally, Mendeley has no integrated OCR functionality, so image pdfs (such as scanned book chapters) should be run through an OCR tool (like Adobe Acrobat) before being added to the Mendeley library or the document content will likely not be catalogued by Mendeley’s crawlers. If users want direct access (i.e. not through Mendeley) to their files through cloud servers, but also want Mendeley on any one of their devices to import documents via the “watch folder,” duplicate documents will be created in the Mendeley database. This is because each device recognizes the new content in the watch folder as new, to that device — and thus adds the content to the Mendeley library. As a fix for this, Mendeley does include a powerful tool for merging duplicate documents, but some users might find the process annoying and/or time consuming. Sync, sync, and sync again. Mendeley only automatically syncs libraries upon opening the application. Thus, if one is apt to regularly switch between devices it is prudent to regularly sync Mendeley’s library manually – or at least to do so at the end of each Mendeley session. The greatest complaint I have regarding Mendeley’s functionality is that annotations made within the body of the text (sticky notes) are not included in the document “notes” section and thus are not included in Mendeley’s search function. These annotations can be exported along with the highlighted text and attached to the document through the Mendeley library, but this does create an extra (and seemingly unnecessary) step in the reading-to-access workflow. Despite its small annoyances, Mendeley’s integration of robust library features and e-reading capabilities make it a solid option for researchers looking to pull together many different perspectives and to discover the nuanced connections that can emerge from a large body of text. Congratulations! You are just a few days from the end of Academic Writing Month. It has been a remarkable amount of work and effort. Perhaps you made all your goals. I have a confession: I struggle to meet goals. Rarely do I set a word or page count to meet and then actually follow through. Sometimes, that makes me feel like a failure. But the process profoundly challenges me to push into new terrain in the composition and drafting processes. My writing can improve trying to meet new goals even when I fail to meet them; trying to run a mile helps even if we huff and puff and walk most of the way. Often, it is the process itself that is illuminated and gives the best take-aways from a month like AcWriMo. My words might be weak on the page but I have learned new skills and tools to keep pushing forward with writing. Trying Scrivener has been a useful lens on my writing process in a deeper way that I had reason to consider before. Years of using Microsoft Word make the first drafting steps seem familiar. Familiarity can trigger all the old habits and hang-ups and anxieties before the first word is even in the document. There are things that a new, shiny tool cannot solve: drafting aversion, anxieties, stress shut downs, revision nightmares, etc. Fundamentally, Scrivener cannot solve the person demons and hang ups that we each carry into the lonely process of drafting. But Scrivener, or other alternative writing tools, can thwart what we expect in the first writing moments. With an altered first step, we have the chance for a new outcome. Scrivener, as a new and unfamiliar writing space, made it easy for me to notice some of my quirks, like the myriad of ways I dart to distraction instead of drafting. Writing can be an anxious process for me. I have had to face my fears about writing in a new way than I had before. I have had to face the things that prevent me from sitting down and getting the work done. In conclusion, Scrivener did not become my new best friend. But any new tool, if we give it the chance, can jolt us out of our detrimental habits. 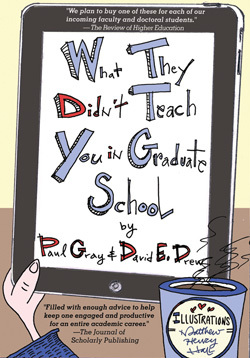 New tools can shine a little light on the more miserable parts of our inner academic world, the difficult places where the shiny ideas and associations that got us into scholarship are not as alluring as they once were. Recognition is the first step toward addressing the far more difficult inner work that a new tool cannot ever solve. Tools are only as useful as we make them. It takes time and discernment and some messing around (and the Longest Tutorial) to figure out what works for us. I raise a glass to you for your hard work! To Scrivener! To our tools old and new and to all the light they shine! Pin board. The ability to shift sections of text around in the document by looking at the note card visual of a project. Zen mode. Cut the distractions and get ‘er done. Integrating media with the writing process. Words not pages. Okay, truth be told, I hated this because the pages make me feel like I got somewhere instead of infinite incompleteness. But shifting my measure of success really impacted my conception of the writing process. 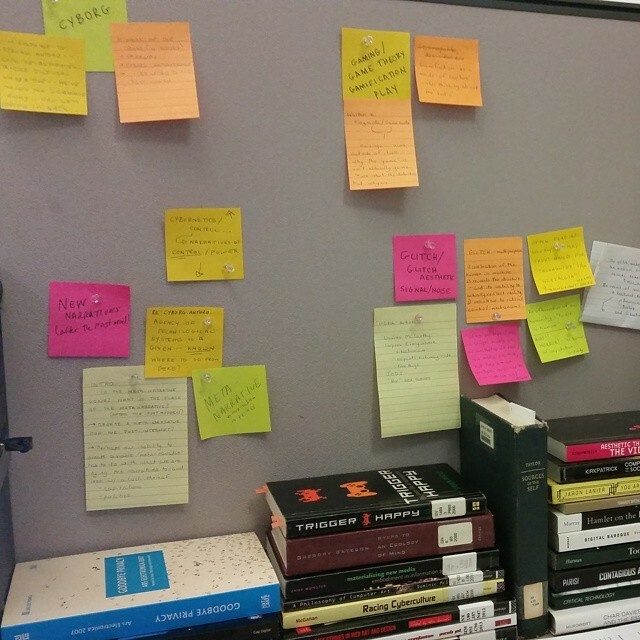 Potential for creative and scholarly work existing in the same project board. 1. 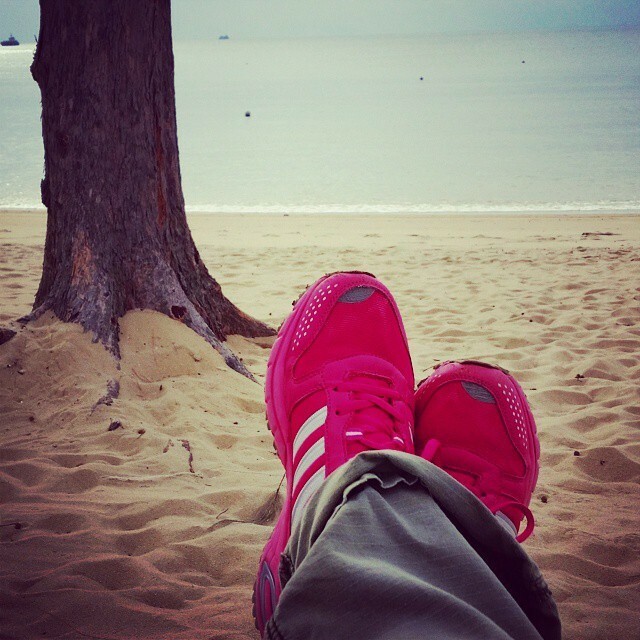 Going Digital: Freeing oneself from the paper prison.. When I first encountered Mendeley upon starting my PhD, I was immediately excited by its potential to overcome both of these challenges. However, at that time, it’s lack of a mobile application (for Android) forestalled its ability to truly allow me to “go digital” — as I believe reading is an activity best completed away from one’s desk. But, even without on-the-go reading support, Mendeley’s library interface proved a powerful tool towards solving the second academic challenge: knowing (or more correctly — remembering). Mendeley’s library interface is not unlike its similar open source alternative Calibre. Though, the design is (in my opinion) a bit more clean and academic. Furthermore, I find the interface and the functionality to be more intuitive in Mendeley than in Calibre. Thus, while Calibre’s large library of open source expansions/plugins probably make it the more powerful digital library, Mendeley’s ease of use and ease of setup makes it the superior library manager for me. After all, time spent learning software is time not spent reading papers! Another key feature of Mendeley’s library is that Mendeley allows users to attach external documents to their original documents. In this way, notes exported from other readers, external notes documents as well as other papers or reviews can be associated with a given library document. Thus, each document in a Mendeley library can encapsulate and make accessible the entire milieu of personal research a user has completed around a given text. In support of my personal research methodology however, Mendeley’s real potential arises from the powerful integration of three basic library features. The three features behind Mendeley’s power are: watch folders, flexible organization options, and its comprehensive and powerful search tool. Mendeley’s watch folder function streamlines the research process by automatically importing and analyzing new files. Once a user sets up a watch folder (which can be any folder(s) on the user’s computer), any documents added to that folder are detected and automatically imported into the Mendeley library. Thus, when I am collecting research texts, I need only dump them in a single (completely unordered) folder and they automatically appear in my Mendeley library. This functionality merges perfectly with Mendeley’s second great library feature, its organizational flexibility. Mendeley allows users to organize their content in a variety of ways including: by tags, in folders, or through citation data or other document metadata. Mendeley’s approach to documents as database objects — which allows objects to hold multiple tags or appear in multiple folders/subfolders — empowers users to rapidly create nuanced lists of subject-specific content without having to build completely new and cumbersome operating-system-based file plans. While the ability to create flexible file systems is likely the most basic function of any library application, Mendeley’s powerful internal search engine provides the real functionality that makes the organizational system shine. Mendeley searches access all of documents’ metadata (citation information) as well as text content, and user notes. As a result, a simple keyword search within one’s own library can quickly create highly nuanced document lists that reveal not only connections within the document’s content but also within the user’s notes on those documents. This kind of search tool — that goes deep into the content of the documents as well as any notes or other documents attached to them — allows users to make the kind of cross-document, cross-authorial connections that would normally require an extremely deep understanding of a large number of scholars and texts. All of the above-mentioned functionality had already made Mendeley an important part of my research system before June of this year. But, despite my regular use of Mendeley’s library function, I was still anxiously awaiting the release of their Android mobile application. The desktop e-reader is a solid interface with a simple but effective system for note-taking, highlighting, and annotating texts. However, without the ability to read on-the-go, Mendeley was never going to liberate me from my paper prison. I am happy to report that, despite its somewhat delayed release, Mendeley’s mobile app is everything I expected and then some. 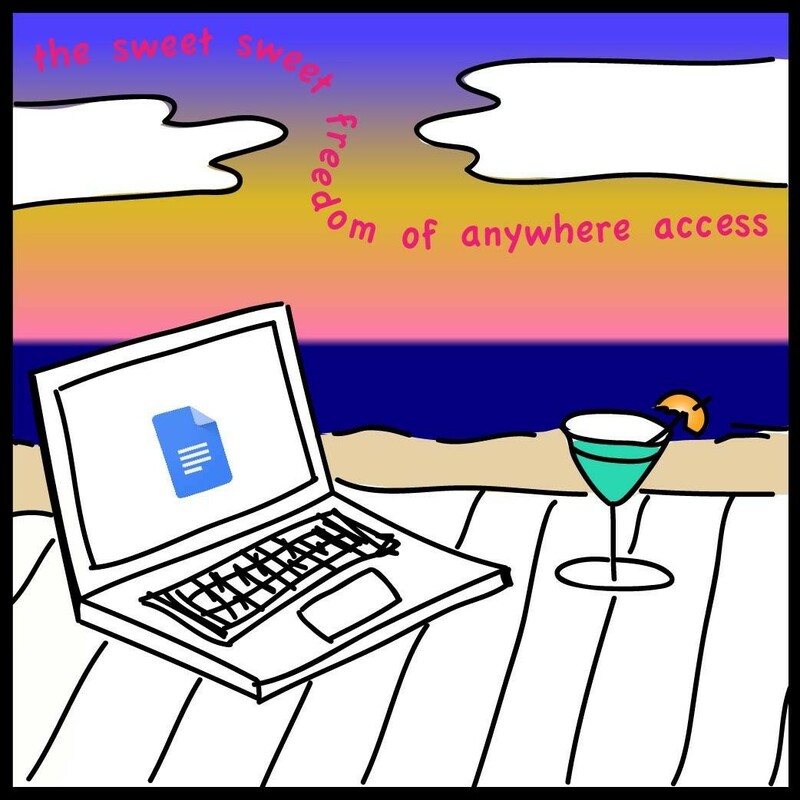 All of the functionality from the desktop version seems to have been replicated in the mobile version with the added benefit of downloading only those documents which you are actively working on — thus protecting the limited resource of device memory while also allowing academics to have access to all of their documents. 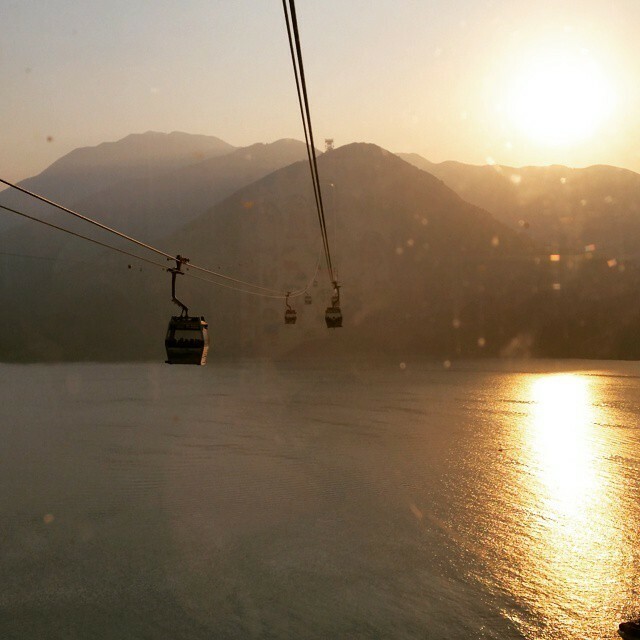 Downloaded texts can be read on or offline and changes made will be synced to the cloud once Internet connectivity is again available. By combining a strong a library and citation managing tool with an e-reader Mendeley makes itself a one-stop-shop for my research needs. In the next instalment though, I will discuss the things I don’t like about Mendeley and some workarounds I have come up with for these challenges. Composition rarely involves just text on a page. 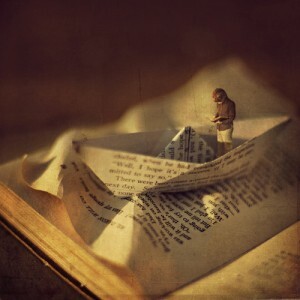 And increasingly, in a digital world post Roland Barthes, we learn to read more than words on a page. Our texts are not simply words but a compendium of different media and sources. And this makes the long academic project incredibly difficult to organize and tackle. It is not a matter of merely arranging our sources to analyze but sorting them and noting them as we construct our thoughts on the page. The writing process is the act of analysis. How can we write in a way that gives us full access to the texts and ideas that motivate us while focusing on getting the words on the page? Can Scrivener be the tool that enables a new kind of writing process? Scrivener creates a writing process that exists alongside constant reference to digital sources. It does not expect you to write constantly flipping back and forth between source documents and your writing process. Various media and text files can be integrated with the writing process. You can add images and YouTube videos and web pages into the Research Folder and easily view them in the split panel frame feature. And really, this is a game changer for the composition process. Interdisciplinary academics draws on multi-media sources as well as text sources. And this is introduces a whole new realm of possible writing processes. Scrivener can participate in that with the split panel frame that allows the writer to consistently view various references while composing. You don’t have to wait until a later stage to begin integrating references and comprehensively analyzing sources. 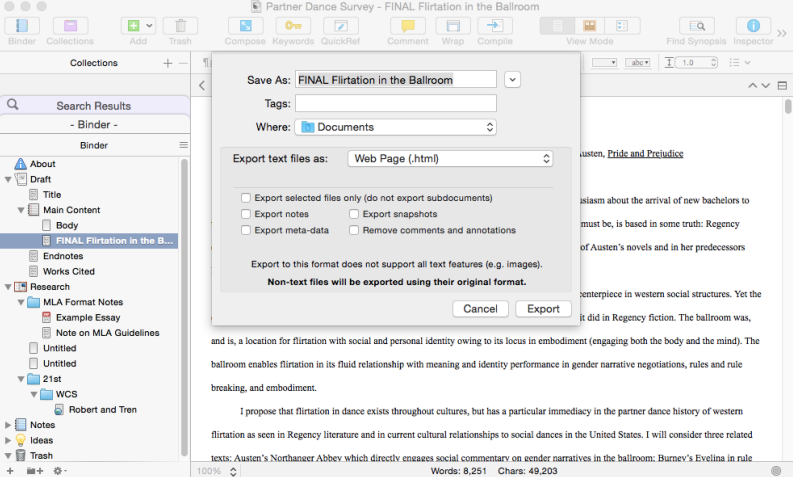 I imported a term paper on partner dancing in literature as a test run for the feature. Over the past week, I have begun revising the text and considering possible ways to break the original paper into multiple texts for publication. My primary task: I needed to collect and arrange digital dance sources and analyze them during the composition process. It was great to have access to YouTube videos of Regency period dance reproductions right alongside videos of contemporary West Coast Swing “Jack and Jill” competitions. I can play a video and easily type thoughts as I viewed the video. This creates a close integration between my written text and the image I view. I can explore the possibilities of real time response as I write. I wanted to integrate the videos into the text itself and easily format the Scrivener file into a digital form. This would allow video to live right beside the analysis rather than imagining my paper being read only on static print paper. Instead, I imagined research being engaged digitally. And this is where Scrivener ceased to help me. Scrivener CAN export to flexible forms like html (yay!) and basic .txt files. For those of you in digital humanities or the like, this will give you all you need to move to create a fully digital text with integrated images and media files. The problem for me is based in my composition philosophy. For those of us without computer know-how, we need formats that allow composition to happen with close integration with media files. And Scrivener’s digital exporting options cannot include images and media files included in the writing text itself. Integrating images and videos into the text itself in a way that is easily exportable to digital formats. What I mean is this: more scholarly writing needs to include images and videos within the text itself. We need platforms that allow our research to easily format with images and videos rather than simply providing links or screen shots to be inserted later. There is a growing integration of sources and formats that is reflected in both writing process and writing outcomes. The way we construct things is not the same as it used to be and we need platforms that allow composition to exist alongside formatting tools. Now, I am aware that this is a highly unfair ask of Scrivener. They never claimed to be the solution to a new age of research formatting and text/media integration. Scrivener has only ever claimed to focus on text production, getting those elusive words on the page. Everything about the tool is aimed at that outcome and that outcome alone. Blaming a platform for not being what it never wanted to be is highly illogical of me as a reviewer. So let’s give some kudos to Scrivener for what it does: creating a split frame feature that permits dynamic reading/analysis and composition process. Full integration into digital platforms with our multi-media sources is just around the corner. Mendeley is a research management/digital library software package. 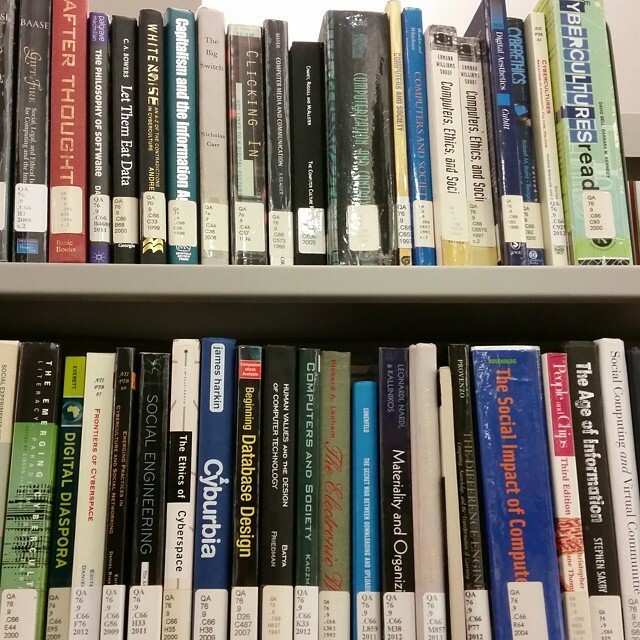 Although the library can manage a variety of media types, Mendeley’s strengths lie in its text-based-content manipulation. The software package includes a reference manager (a la refworks, or Word’s embedded citation manager), a digital library interface (like Calibre), an e-reading application (similar to Kindle Reader, Adobe Reader, Preview, Google Books etc), and a collaboration tool which allows researchers to share documents and view each other’s notes. It also includes web-based social functions such as the creation of profiles, much like Academia.edu. Documents imported into the Mendeley library are also backed up to cloud servers along with any notes, highlights and annotations. These documents are synced to the cloud and available across computers/devices. Mendeley is not necessarily the superior option for any one of these functions, but its ability to integrate all of these functions into one software experience makes it a flexible and streamlined option, wherein researchers are able to pick and choose the functions that best suit their research styles, creating an ideal research management tool. I don’t use all of Mendeley’s features. For instance, I have never used Mendeley’s social or collaboration tools, though I can see why they would be useful for group-work situations. I also rarely use Mendeley as a reference/citation manager as I do most of my writing in Google Docs. Google Docs does not (directly) support Mendeley citations and while there are workarounds available to use Mendeley’s citation engine in non-supported word processors, I am lazy and create my citations in the old-fashioned way. In the few cases where I have used Mendeley as a citation manager, I have found it intuitive and powerful. It creates citations and bibliographies in an impressive number of journal-specific/general styles with tight integration for Word, LibreOffice, and BibTex. In the next two posts, I will review Mendeley’s functionality as a Library Interface and as an E-Reader. Finally, I will review discuss some of the cons of a move to Mendeley and suggestions to get around them. The hardest part about learning to use Scrivener is the instructions in the longest tutorial ever created. And I do mean long: 22+ mini-articles that take more than predicted three hours to read. As a busy person, I did not appreciate how difficult it was to fully learn this new tool. As I said before, I’m not a techy. Tutorials are absolutely necessary for me to survive in this world. But the instruction was indirect and chatty rather than efficient and to the point. The upside is that the tutorial is written for the non-techy (me!). It imitates the friendly voice of the eternally patient friend. The tutorial writer will not shame you for any confusion. It gives suggestions and helpful guided practice. And it is very, very thorough. By the end, you have experienced every feature that Scrivener offers. But long-winded paragraphs are not how I learn. On a good day, I struggle to read instructions accurately. I won’t tell you the number of times that I’ve destroyed the simplest banana bread because I misread the teaspoon of baking soda as a tablespoon of baking powder. If the instructions are not even in a list form, my mind wanders. The tutorial became an enormous barrier to me employing Scrivener as a new tool in my writing projects. To do the job thoroughly, it took six hours. By the time I finished, I had forgotten many instructions from the beginning. Albeit, the friendly tutorial encouraged me to take several tea and biscuit breaks, and even a glass of wine. I completed those instructions perfectly. So is Scrivener worth the tutorial? As with all things, it depends on your project goals. For some, Scrivener is not going to have the pay off that they want after such a steep learning curve. For others, they won’t find it that difficult to learn and therefore can jump right in. Others will find it difficult but well worth the effort. I suspect that I am in this final category because of my work style. I, for one, am a compiler, collecting notes and references and short paragraph sketches and section headers into a large, tangled pile before I can write a basic thesis. Scrivener, once I get used to it, has all the features that my old school sticky note piles but without the difficulty of reading my own hand writing or losing anything. Instead, I can employ my same project tactics but in a visually clean word processor. I no longer have to separate my initial thoughts from the drafting document itself. Every writer and academic is unique, and never more so than in their project habits Scrivener is designed to be useful to the most tangled work styles. The hope is that anyone using it can tailor it to specific and quirky structures. If Scrivener were any simpler, it would not accomplish its goal of being flexible to the awkward, unaccountable tactics we each take to sort our ideas into comprehensive arguments and order. But getting comfortable enough in Scrivener to “be you” takes time that none of us have. So here’s my advice: only use the shortened tutorial. Do not sink yourself into the full tutorial—unless you adore the rambling explication of tools in a 22 Step Process. Play with Scrivener as you develop your project from brainstorming to completion. And when odd buttons and difficult tasks frustrate you: use the YouTube videos. A visual demonstration was more helpful and faster than the chatty written guide. Even with the initial barriers, it does not take long to see how Scrivener can particularly help academics. I am going to quickly highlight some of those features for the beginning users. I include the tutorial sections that tell you about these features. It can be incredibly difficult to integrate footnotes and annotations into long research documents using Microsoft Word. Formatting becomes a tedious process and can clutter the pages. Or, on the other end of the spectrum, it can be easy to miss footnote content. Scrivener allows footnotes to be stored away from the working text itself, a kind of digital sticky note that you can open as needed. In addition, you can import actual reference texts into your project so everything is one place instead of strewn across document folders and various reference works. Split pane feature is a beautiful tool to use with references. 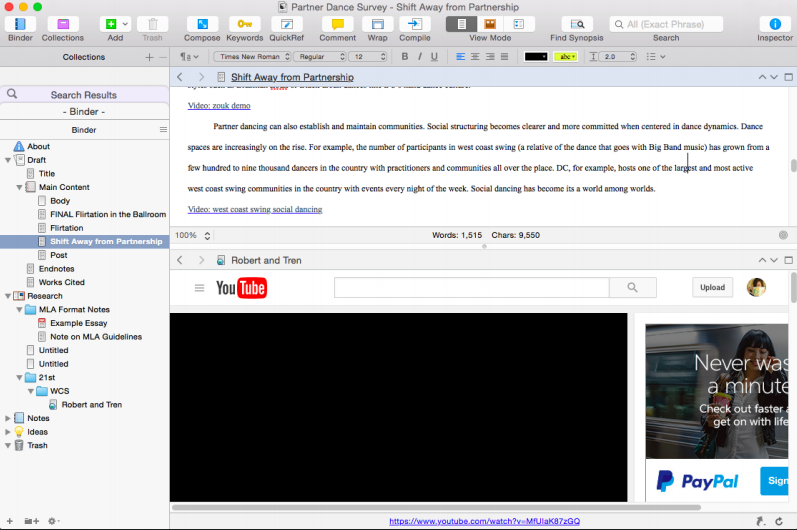 The screen splits in two and two documents can be viewed at the same time. I find that integrating references often requires flipping back and forth between browsers my tiny laptop screen; it’s annoying at the very best and confusing at worst. Split pane allows you to view the PDF you found in JSTOR or the screen shot of the webpage you are analyzing at the same time you are writing your analysis. As Scrivener acknowledges, this is not innovative in the world of word processors. However, it is great that it is there. Go into Composition Mode and it is just you and your text. Composition mode allows you to access many of the Scrivener formatting and writing tools without having to exit the focused view. With the significant word counts every day this month, focus is essential. Next week, I’ll address how Scrivener affects interdisciplinary projects, particularly those that require multiple forms of media like in the digital humanities. I am not a techy. New programs are a nightmare I indulge in only on Halloween. Backing up my new laptop took a frantic struggle with a defunct external hard drive and far too much money spent on new external hard drives. Oh, and it took nine months after I bought the new computer. I could have born a child in that time frame. I am not a techy. I am a writer and an academic and a student. I write. A lot. 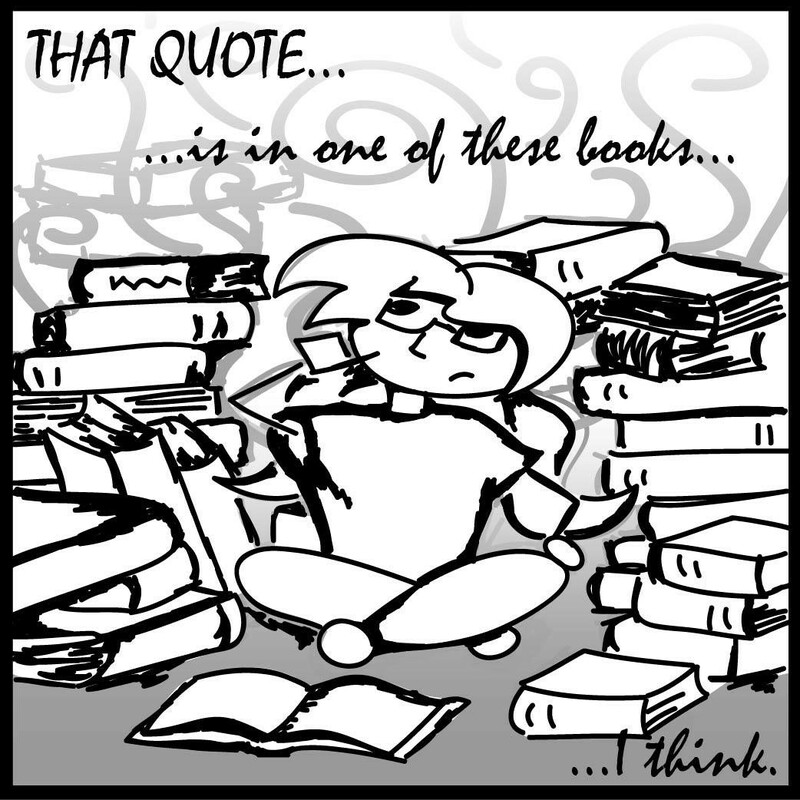 My projects vary from short articles to unwieldy term papers to an appalling thesis that thunders overhead. 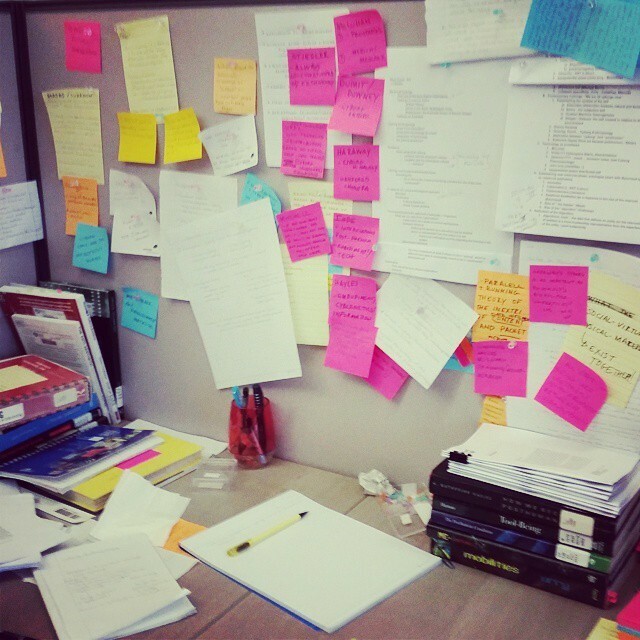 I get the challenges of organizing projects and arranging goals within the tangled mess of word documents and file labels and the notation fiascos and revision comments. I am the patronus of all non-techy writers. I am the struggle of man vs machine. But a few months ago, I began to wonder what existed to help me that I had simply overlooked. Was there a program out there that could help my writing process? A program that would allow my messy structures to continue intuitively but suddenly renders them comprehensible and (of all beautiful things) searchable? It seemed a lot to ask from an inanimate object. Then someone introduced me to Scrivener. They claimed it could solve all my problems and more. And if I could finally get that external hard drive to back up and open an account with Drop Box, perhaps I could learn how to use this new tool as well. Oh, and they offer a one month free trial. What would be the harm in trying? Let me back up and explain exactly what Scrivener is designed to be. Scrivener is a word processor designed by writers for writers. But when I hear the term “word processor” I immediately think of Microsoft Word. In fact, Microsoft Word is merely a product name for just one of many word processors that exist out there. 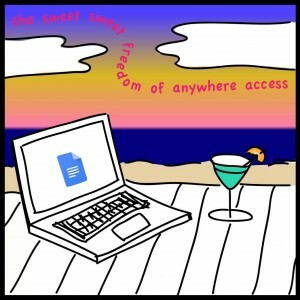 According to a Google Search, the technical definition of a word processor is this: “a program or machine for storing, manipulating, and formatting text entered from a keyboard and providing a printout.” It’s a very basic definition of what used to be revolutionary but is more humdrum to us now. We can use a program that let us see ourselves compiling words and then allow us to print those words on paper. Magic! Scrivener is one just processor and one designed for writer and writing projects rather than a multi-industry interface like Microsoft Word. Is comes packed with odd and inventive features that I’m pleased to share with you like “Zen mode” (a focus viewer), split screens, brainstorming tools, and more. But I’m getting ahead of myself! 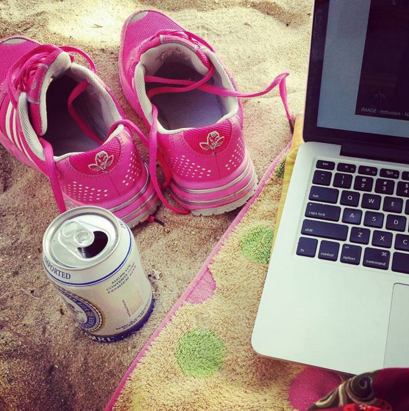 Join me in AcWriMo as I share with you my first time, non-techy Scrivener user experience! I will share the ups and the downs, the positives and the negatives, some how-tos and what to avoid. 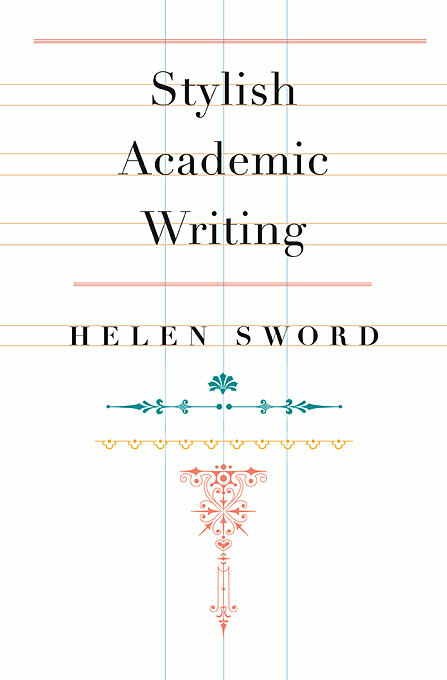 At the very least, exploring Scrivener in AcWriMo will uncover plenty of important food for thought about the academic writing process and all the challenges of surviving it! CITE EFFICIENTLY. Take advantage of new citation tools. Everyone will have a personal preference but with so many tools to choose from, you can find one that – with a bit of initial effort – makes life a lot easier in the long run. Citation doesn’t have to be a laborious task tacked onto the end of an otherwise exciting project; now you can cite as you write and not lose track of important references. Want to be a full-time Hackademmic ?Get on track and read this tips. 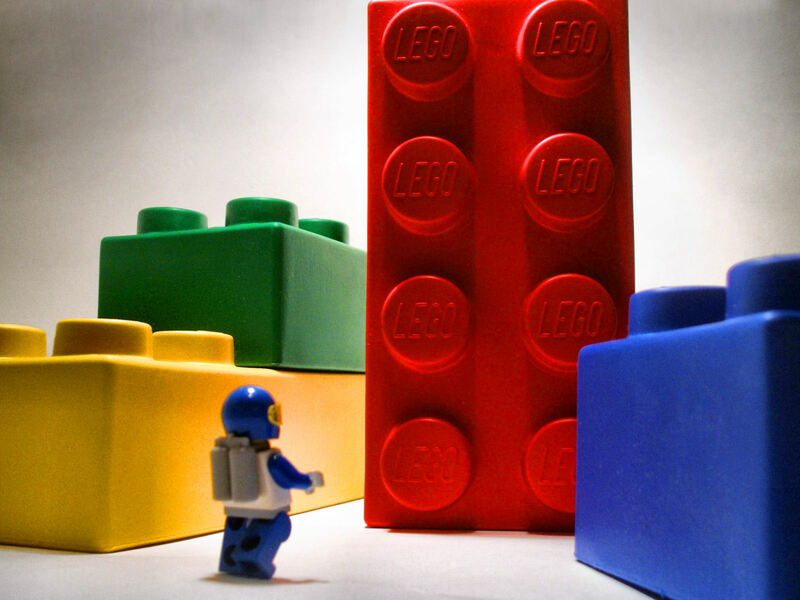 In the second of two posts about Writing Accountability (the first of which introduces the initiative and you can read about here), Jennifer Lim explains how writing progress can be effectively measured and managed. 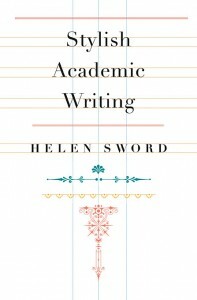 Jennifer’s post is part of PhD2Published’s new Academic Writing feature. For accountability to work, measuring and monitoring progress are essential too the writing process. Monitoring your own progress helps in recognizing current productivity status and finding ways to improve it. Setting an ultimate goal and daily writing plan to achieve it is important for improving writing productivity. Progress measurement is of great interest to me. As there is no strict rule about how writing progress should be measured, in the Writing Accountability initiative, I find it amazing that everyone has different ways of measuring their personal progress. Here are some examples of how to measure writing progress in order to develop accountability. Although some measurements are similar, there are still many different ways of doing it. The most practical method is word count. Whether the final writing achievement is a few thousand words of an article or more than 10,000 words of a dissertation or thesis, word count is the best way to measure and monitor writing progress towards an ultimate writing goal. It is also best to break down the ultimate writing goal into smaller daily goals. Let’s say you need to write at least 12,000 words in 6 months and that most probably you do not plan to write over the weekend. This equates to at least 100 words per day in order to achieve 12,000 words in 6 months. By having this daily writing goal of 100 words, you have a clearer writing plan to help to achieve the ultimate goal and can diminish the overwhelming feeling that a larger word count often creates. If writing 100 words a day is too easy, set it higher or to a limit that you feel is challenging enough to motivate you to write daily. Writing is not the only thing one does as an academic however. A lot of time is also spent on reading, making notes, data collection and data analysis etc. Should we not measure those that actually contribute too the final product of our writing? What is the best way to measure these? I personally think the daily time spent on these activities should also be considered. This helps to minimize the feeling of unproductiveness if no significant words are written on those days when other academic activities take precedence. So, another good way to measure daily progress is the total time spent. Set a minimum time that you are willing to spend on a daily basis to work on your academic activities, including reading, literature review, etc. Your time target should be reasonable and something that you can achieve such as 1 or 2 hours a day. Setting a target too high will only decrease your motivation if you can’t achieve any at the end of each day. It is viable to combine both word count and time spent measurements as the daily goal. In that way, you can measure word count when you are writing and time spent when you are working on other relevant academic activities. I also find it is beneficial to record daily progress together with some comments about what has been achieved or lack thereof so reflection is possible for self improvement. Another example of measurement is from Sarah Ford (who Tweets as @Sarah_M_Ford). She has a unique formula of calculating ‘score’ to measure her daily progress (learn more about it here). 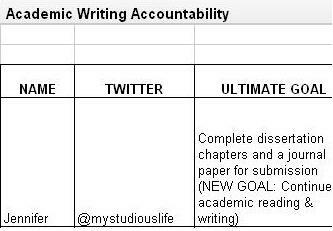 Other than using the spreadsheet for progress update in writing accountability, there are also some #AcWri enthusiasts who like to blog or tweet about their writing goals and progress. The #AcWri community on Twitter provides great peer support where people are sharing writing advice and encouraging one another in the writing process. If you work better with pressure, the #AcWri community can also act as (positive) peer pressure. Seeing others progressing well when you are not provides encouragement to improve your own productivity. Either way, participating in the #AcWri community will only benefit your progress and increase your motivation. Knowing you are not alone in whatever obstacles you are facing provides good solace. The key to accountability is: knowing what you need to achieve and making sure you put in the effort to achieve it. Regardless of how you measure your progress, all you need to do is to find the best way to achieve the ultimate goal by setting targets that are reasonable and achievable. DEVELOP A POOL OF RESEARCH REFERENCES STORED IN YOUR COMPUTER. It is one of the most useful things you can do. You will use the same references over and over as you do research, as you write pa­pers, and as you teach. You will add to this list as you read new articles and books in the literature. We personally recommend the software called EndNote although other similar kinds of software are on the market. Software for references contains three useful features: It provides a standard form for entering references so that you remember to include all the necessary data. Separate forms are provided for each type of reference (books, articles, newspa­pers, Internet URLs, etc.). It automatically converts the format to the reference style of the journal to which you are submitting. 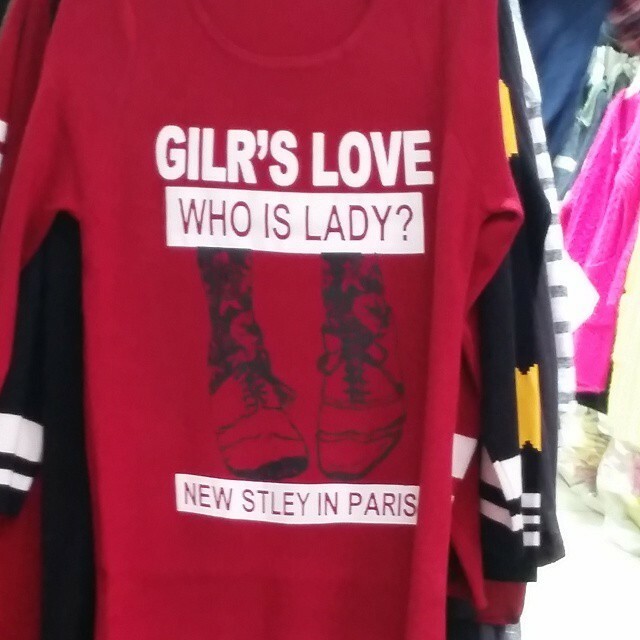 Lots of different styles are available. Since you may be sending an article to several journals sequentially before it is accepted, this au­tomated feature saves you hours of drudge work in converting reference formats. It provides space for including abstracts and notes so that you can record what the reference was about for future retrieval.